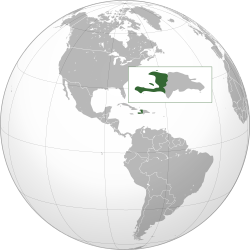 Haiti (/ˈheɪti/ (muChiFrench: Haïti [a.iti]; muChiHaitian Creole: Ayiti [ajiti])) inyika iri muCaribbean. Nyika iyi ine miganhu neDominican Republic neThe Bahamas. This page was last edited on 22 Zvita 2013, at 16:40.